Happy Saturday stampers! I've got a wonderful day ahead with family time in the morning and evening and a big stamp camp in between! I realized the other day that I'd not posted these stamped tiles here yet and I made them back before Christmas - so I guess it's about time you got to see them! I recieved a stamped tile as a gift from my SU! demo buddy Denise Johnson back in the early fall and just loved it. 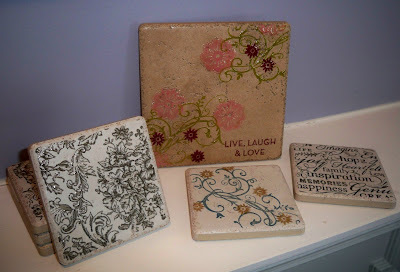 I loved it even more when she told me how easy it was to create so I included the large "Live, Laugh and Love" tile in my Christmas Gifts class. These were such a hit I decided to make some as Christmas gifts for family and friends and created some coaster sets as well. The coaster sets are actually my favorite and all of Emma's teachers liked them a Lot! The blank tiles came from Lowes and they are the glazed ones, not the tumbled tiles. They do not soak up water. After I washed them off, I used Craft Inks and various stamps to create the images. They were coated with Glassy Glaze Embossing Powder and baked in the oven to melt the powder. Once they cooled off, I put cork feet on the back side and they were ready to use! The large Trivet Tile in the back of the photo used the Baroque Motifs stamp set with a greeting from the On Your Birthday stamp set. It's stamped with Regal Rose, Old Olive and Bravo Burgundy Craft ink. The coaster in front of it uses the same stamps, but with Not Quite Navy and Copper Encore Craft ink. The coaster set to the left uses the Bella Toile background stamp and Basic Black Craft ink. I made sets of these with the same stamp but using Night of Navy, Old Olive and Bravo Burgundy Craft inks for Emma's teachers. They all turned out really lovely and the stamp looks different in each color. Lastly, the coaster in the right of the photo is the Tres Chic background stamp and Basic Black Craft ink. I just love this Black on White look for these words - very "in" these days. Thanks for stopping by today and everyday you check in on me! I love to hear from you and know that you find something here to inspire you or to bring you joy. These are fantastic! You are just the alter queen this week!!! These are really wonderful Robin! :) I've never done tiles with the glassy glaze. sounds like fun! Blogger's Challenge #88 - Alter It! Wow, I feel like Sally Field! Butterflies are in the Air!